Eastern Bank Ltd Management Trainee Job Circular 2017. Eastern Bank is one of the leading bank of Bangladesh just announce a new job circular for freshers. This new job opportunity is a great news for new students who have completed their graduation recently. You will get a clear description about this new bank job circular in April 2017. 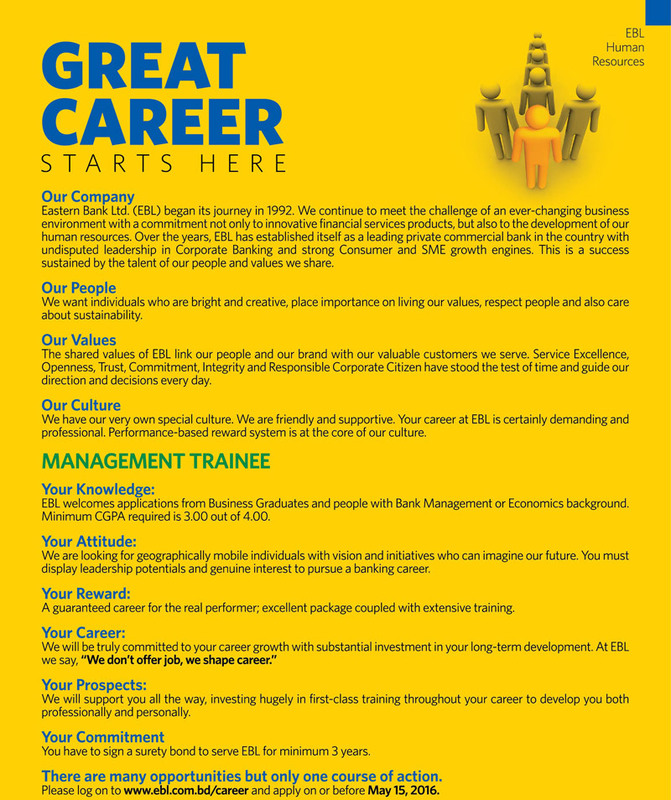 It is a Management Trainee Job circular that is announced by Eastern Bank Limited Bangladesh. Bank job is one of the most preferable job in BD. So,this job brings a great opportunity for the job seekers. You can also take a look to Janata Bank Question Exam 2017 Executive Officer (EO) or Bank Asia Job Circular 2017. Stay connected to our Facebook Page by giving a like. Let’s take a look to this new Eastern Bank Job Circular 2017. Education Qualification: Minimum graduate in Business Studies.